I've spent the past three days reading forums trying to understand and resolve this problem on my own. I've actually learned something through this problem, so every cloud has a silver lining as they say. First off, im totally new to Linux and know nothing about it. The situation is that i have an old macbook (32bit, 2ghz core duo, 1gb ram, 80gb HDD) and OSX is just too slow and bogged down. I downloaded the Lubuntu Desktop ISO and with alot of research was able to get it to boot from my USB on my macbook. (Apple makes it so hard to boot none apple oses from USB unfortunately) and my CD drive is broken, so USB is my only option..
What a difference, the system is so lean, so fast, so responsive, i have fallen in love with it. However when i try to install the system from the icon on the desktop, i get an error towards the end of the installation - Unable to install grub to /dev/sda - i have since noticed that SDA is the USB stick that i am booting from, rather than my internal hard drive. After so many retrys, it seems that the installer - no matter what i do, attempts to install the grub bootloader to the USB stick that the live system is running from. enter image description here I would really appreciate any help that anyone can offer me, and i would like to say sorry in advance as i am ignorant to linux and understanding the system. here is a screenshot of the error and log. Here and here you will find useful information, take a look at it. thank you so much. I followed your instructions to the letter, however it seems that apple runs a none standard EFI system, this was causing issues with the installer. Not the answer you're looking for? 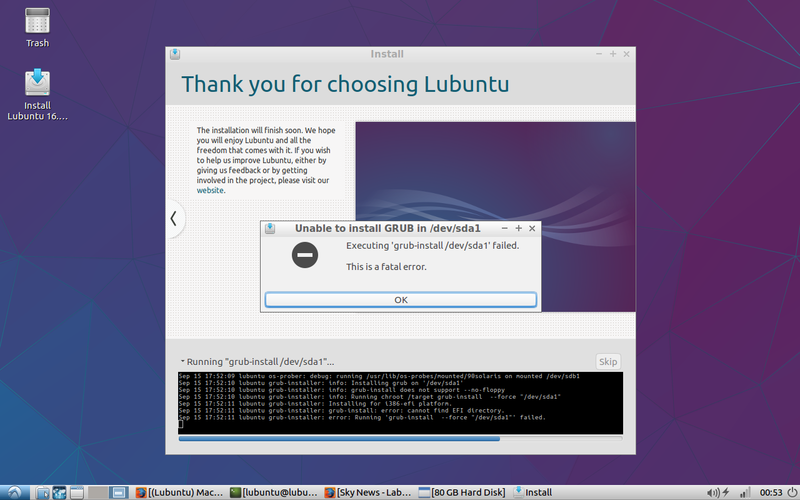 Browse other questions tagged grub2 system-installation lubuntu macbook or ask your own question.